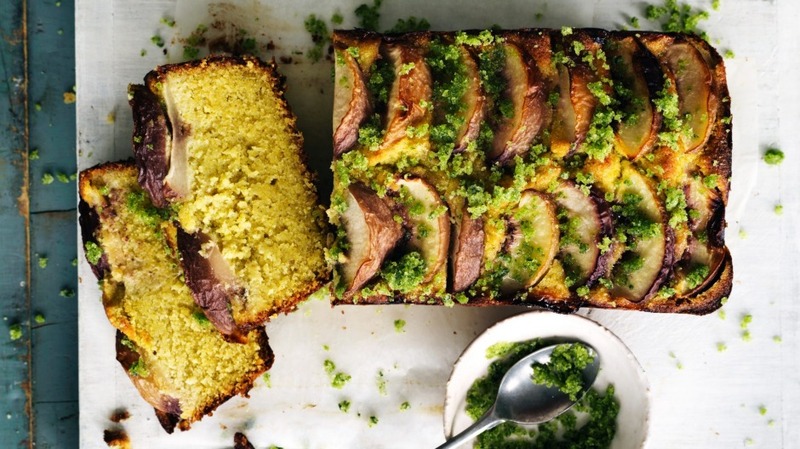 Basil-flavoured sugar adds a subtle dimension to this pleasingly gritty Italian-style cake. Preheat the oven to 200˚C (180˚C fan-forced). Grease and line a 1kg-capacity loaf tin (about 22cm x 12cm x 7cm) with baking paper, allowing a generous overhang on the sides to make it easier to lift out the cake later. Place the sugar and basil leaves in a food processor and process until you are left with a gloriously damp emerald-coloured sugar. Set aside 2 tablespoons of the sugar for sprinkling on top of the cake later. Place the rest in the bowl of a cake mixer and add the butter and lemon zest. With the paddle attachment in place, beat on medium-high speed until mixture is pale. Add the eggs, one at a time, beating well after each addition. It will look curdled, but this will not affect the end result. Add the ricotta and lemon juice and mix on low speed to combine. In a small bowl, place the almond meal, polenta, baking powder and salt. Whisk together to combine, then over low speed, add to the butter mixture in three batches. When fully incorporated, scrape the mixture into the lined loaf tin, smoothing the top. Arrange the nectarine slices on top, overlapping slightly, then place in the preheated oven and bake for 1 hour and 20 minutes, or until a skewer inserted into the middle comes out clean. Cover the top loosely with foil if the fruit looks like it is getting too dark. Allow to cool in the tin for 15 minutes before lifting the cake onto a plate. Sprinkle with the reserved basil sugar and serve. Says Helen: The use of vanilla-flavoured sugar is well-known for baking, but herbs are another easy way to add subtle flavour. I've layered the basil flavour in this pleasingly gritty Italian-style cake – the emerald-green sugar is creamed into the batter as well as sprinkled on top after baking. Experiment with other herbs and flowers too – lavender with blueberry; mint with strawberry; rosemary with lemon or orange. And incidentally, swapping the nectarines here for apricots, and the basil for thyme, would make a fine substitute for this cake.